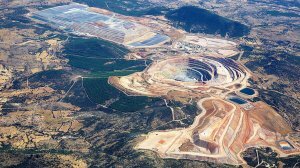 The board of Vancouver-based miner Eldorado Gold has approved a $520-million investment in a mill project at the Kisladag mine, in Turkey, paving the way for 270 000 oz/y of production over a nine-year mine life. The 13-million-tonne-a-year mill project, which will see Kisladag transition away from heap leaching, will begin commissioning in late 2020, with first production expected in the first half of 2021, Eldorado reported this week. The feasibility study for the mill project returned a net present value of $392-million and an internal rate of return of 20.4%, with a 3.9-year payback period. With the board approval to advance the mill project, a review of the useful lives of the Kisladag heap leach assets resulted in an impairment charge of $117.6-million being recognised during the quarter. As a result, the net loss attributable to shareholders of the company for this quarter was $128-million, or a loss of $0.16 a share, compared with a net loss of $4.2-million, or $0.01 a share, in the third quarter of 2017. Eldorado reported an adjusted net loss for the quarter of $21.9-million, or $0.03 a share, compared with adjusted net earnings of $1.3-million, or $0.00 a share, in the comparative quarter of 2017. Meanwhile, the miner said that its operations continued to perform well, resulting in a further production guidance increase. This time to 345 000 oz to 350 000 oz at cash operating costs of $600/oz to $650/oz, from a previous guidance of 330 000 oz to 340 000 oz and an initial guidance of 290 000 oz to 330 000 oz. The higher guidance is primarily attributed to expected higher production at Kisladag, partially offset by a guidance reduction at Olympias. The 2018 guidance for Olympias has been revised to 45 000 oz to 50 000 oz at a cash operating cost of $600/oz to $700/oz, down from original guidance of 55 000 oz to 65 000 oz at a cash operating cost of $550/oz to $650/oz sold.